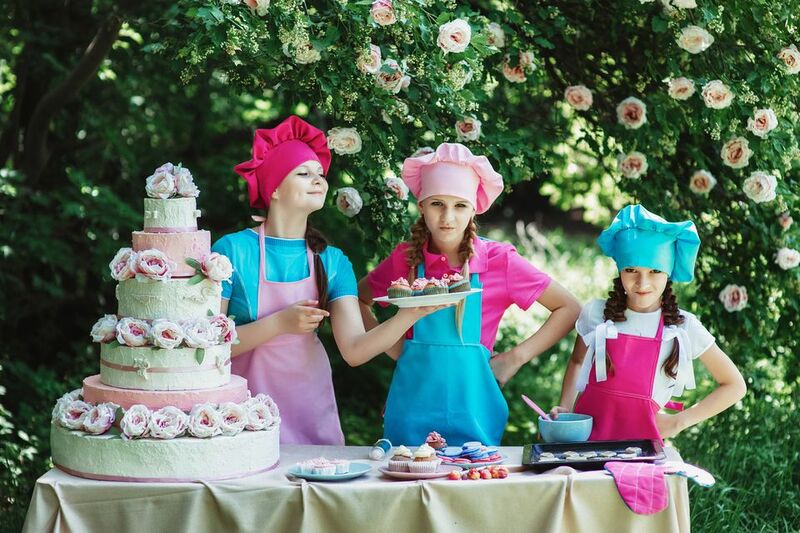 Looking for more fun ideas for your kids' cooking party? Add a few of these fun cooking party games to the menu and you just might get a four-star review! Teach the guests at your cooking party how to fold napkins in different styles. Once you have taught them, have them compete to see who can fold their napkins the fastest, or set a timer and see who can complete a variety of different fold designs before the buzzer rings. To play this game, blindfold a player and have the remaining party guests challenge her to guess different foods by feeling, smelling, and tasting them. Start out with three different foods. Score a point for each correct guess. When the three items have been taste-tested, pass the blindfold to the next player and begin with three new foods. The player who scores the most points wins. To play the pasta relay, divide players into two teams. Have the teams line up behind two empty pots at one end of the room. At the opposite end of the room, place two pots filled with dried pasta. Give each team a ladle. On the word, “go,” the first players in line must race with their ladles to the pots filled with pasta, scoop out as much pasta as they can, and run back and dump it into the empty pot. The ladles then get passed to their teammates, who must do the same. The first team to transfer all of the pasta from one pot to the other wins the race. Another fun cooking party idea is to play this game bucket-brigade style. Have teams form a line that extends from one pot to the other. Each player gets a ladle. At the start of the game, the players next to the full pot must scoop out a ladle of pasta and then pour it into the ladle of the player next to them. The transferring of pasta from ladle to ladle continues down the line until the last player dumps his pasta into the pot. The first team to fill their empty pot in this manner wins the race. A pinata is always a fun kids party game. For a cooking party, a pinata shaped like a chef’s hat, birthday cake, cupcake, popcorn, hotdog, or any food item would fit the theme. Challenge party guests to test their estimation skills with this cooking game. Gather the ingredients needed for a particular recipe. For each ingredient, set out a bowl, but take away all measuring cups, spoons, and devices. Have players fill the bowls with what they think is the correct amount of ingredient. Then, take out the measuring devices to see how close they came to getting it right. The player who came the closest wins. Before the party, hide several different shaped cookie cutters around the play area. Give the kids a list of the cookie cutters they must find. You can even get creative by giving hints instead of naming the shapes. For instance, instead of listing: “fish-shaped cookie cutter,” you can say “cookie cutter that swims in the ocean or can be found in a tank.” Once the players have gathered all of the cookie cutters, they can begin using them to cut out the dough and bake their own cookies. Another kitchen scavenger hunt idea is to hide the utensils, ingredients and other items needed to complete a certain recipe. Kids must gather all the items in order to perform their cooking tasks. To play this cooking party game, divide guests into two teams. Set up one folding table for each team, or, if you have a long dining table, assign one side of the table to each team. Give each team a set of items they will need, along with a diagram of how to set a formal table. The first team to set their table properly wins. Divide your party guests into teams. Give each team a recipe that you have printed with scrambled words for the ingredients and instructions. Teams have to unscramble the words and put the recipe in the right order. Once they can read their recipes, they must collect and prepare their ingredients according to the instructions. The first team to prepare their dish wins. Give players a chance to dress like a chef with this fast-paced relay race. Divide players into two teams. Give each team a chef’s hat, an apron and a pair of oven mitts. Have the first player in line for each team put on the chef’s outfit, then quickly take it off and pass it to the next player in line. The next player must repeat the task of putting on and taking off the chef’s clothing. As the chef’s clothing is passed down the line, each player must do the same. When the last player in line has donned and removed the chef costume, he must return it to the player who started it all. The first team to have its first player wear the chef’s outfit a second time wins the race. To play the chopstick race, have guests sit around a table. Each kid gets a pair of chopsticks, an empty bowl and a bowl of small food such as mini marshmallows, cereal loops or raisins. Set a timer. The players must use the chopsticks to transfer as many pieces of food from the full bowl to the empty bowl as they can. Once time is up, count the pieces. The winner is the one with the most food pieces in his bowl.